Over time, both customer and regulators expectations of banks have grown. Fraud is expected to be stopped before transactions go through, rather than after-the-fact, This means utilizing predictive models, real-time analytics, and having well connected systems. The need for better, more agile systems only continues to increase. But for many, current systems are complex and not centralized. Often, giving access to certain users, such as regulators, is difficult making the audit process painful. TIBCO Cloud™ Live Apps offer a solution to this problem. It empowers business developers to design an application so that you can more easily connect and engage with your company’s systems while adapting to ever-changing regulations. However, historically the responsibility of creating such apps has fallen on IT departments. But because IT is backlogged with other requests and less familiar with the business needs, this process can be slow and difficult to manage and alter as needs and regulations evolve. Instead, Live Apps, a low-code application development platform, allows citizen developers to create a solution on their own. The process is quick and requires little to no coding. It allows those most familiar with business needs to create a best-fit solution. It also allows these users to easily make modifications and grow the solution over time. By using Live Apps in conjunction with the Risk Management Solution Accelerator businesses can better detect fraud while ensuring swift, collaborative, and auditable investigation of all suspicious transactions. 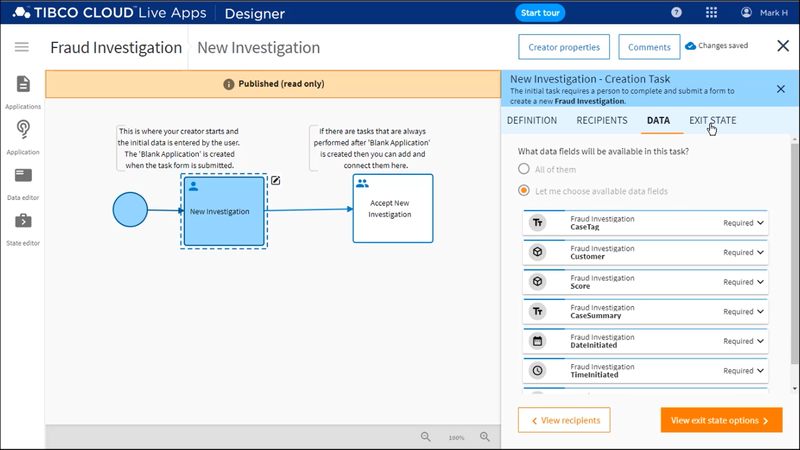 Watch as TIBCO Cloud Live Apps is used with the Risk Management Accelerator to detect fraud, manage investigation, and meet increased regulations. The Risk Management Solution Accelerator is able to sift through millions of customer transactions and flag any that appear suspicious. Once flagged, it is necessary for those transactions to be analyzed and managed through to resolution. Live Apps makes that case management process smooth by offering built-in rules, process, collaboration, and audit features at its core. Live Apps extends your banking systems, connects them, and unifies fraud detection and management capabilities under the same roof. Banks are then able to streamline operations and empower their organization to tackle fraud with the right insights in real time.